The skilled technicians of TDS repair all common transformer oil leaks likely to be encountered by utility maintenance personnel. Our repair methods can in most cases be performed without removing the equipment from service, resulting in substantial cost savings and increased flexibility to utility managers. 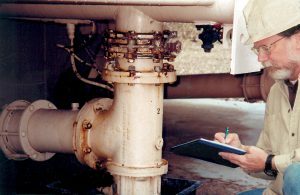 Effective repair of transformer oil leaks begins with determining the exact component that is leaking. Visual inspection of the oil leak location is often inadequate. Click the link below for details on how TDS personnel will pinpoint the exact piece of equipment that is leaking allowing us to concentrate our efforts in that location. Transformer Leak Repair Procedure: Oil Leak Detection. Many transformer oil leaks are associated with the failure of gaskets on flapper and butterfly valves controlling the flow of oil between the radiator and main oil tank. Deterioration of the packing on flapper and butterfly valve stems can also be a source of oil leakage. Additional bolt tightening rarely stops the oil leak. Click the links below to see how TDS technicians can repair transformer oil leaks associated with oil flow control valves. In most cases, repairs can be accomplished within hours, without expensive downtime required to drain oil from the cooling system. Numerous other locations on power transformers are prone to oil leaks due to penetration of bolts and threaded connections typical of Temperature Probes, Liquid Level Gauges, Flow Gauges, No-load Tap Changers. TDS repair techniques are effective in addressing these types of leaks also. Click the links below for details on these TDS repair procedures. Contact TDS today to arrange for our free Substation Survey. TDS repairs your transformer oil leaks or you don’t pay.